DENVER, June 8, 2017 /PRNewswire/ -- DaVita Inc. (NYSE: DVA), a leading independent medical group and a leading global provider of kidney care services, is excited to celebrate 10 years of "Village Green," the company's corporate sustainability program. Village Green was created in 2007 with the goal of reducing the environmental impact of the company's operations in field facilities and in business offices while educating both teammates and patients on the environmental impact of these changes and what they can do to help. "At DaVita, we consider ourselves a community first and a company second," said Casey Stock, sustainability manager of DaVita. "As a community first, we believe this extends to our world. Together, we can make our Village a greener, healthier place for our patients, our teammates and our world." 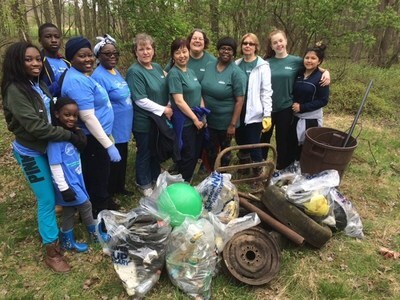 Earth Day Village Service Days were created in 2014 to encourage teammates to volunteer for a service project in the month of April that would benefit the environment, such as planting trees or cleaning up a beach. This year, DaVita teammates volunteered nearly 15,000 hours in 11 countries through 328 community service projects. In addition to Earth Day Village Service Days, Village Green works to reduce the company's environmental footprint through a variety of green initiatives. Since 2013, DaVita has saved 645 million gallons of water through water optimization projects. Through toner and cell phone recycling programs, more than $126,000 has been donated to Bridge of Life, a nonprofit organization that is focused on improving access to primary care and dialysis treatment in underserved communities around the world. In 2016, Village Green launched a formal electronic waste program and recycled more than 113,000 pounds of e-waste. DaVita Inc., a Fortune 500® company, is the parent company of DaVita Kidney Care and DaVita Medical Group. DaVita Kidney Care is a leading provider of kidney care in the United States, delivering dialysis services to patients with chronic kidney failure and end stage renal disease. As of March 31, 2017, DaVita Kidney Care operated or provided administrative services at 2,382 outpatient dialysis centers located in the United States serving approximately 189,400 patients. The company also operated 162 outpatient dialysis centers located in 11 countries outside the United States. DaVita Medical Group manages and operates medical groups and affiliated physicians in California, Colorado, Florida, Nevada, New Mexico, Pennsylvania and Washington in its pursuit to deliver excellent-quality health care in a dignified and compassionate manner. As of December 31, 2016, DaVita Medical Group's teammates, employed clinicians and affiliated clinicians provided care for approximately 1.7 million patients. For more information, please visit DaVita.com/About.